I’ll go into each of these points in detail below. If you plan to attend panels and hit the expo hall, you’re going to need to put together a schedule. There are set time slots for panels, so you should have set time slots for comic book hunting. When creating a schedule, the key is to be able to quickly see when you’ll be in panels, and when you’ll have time to hit the expo hall. 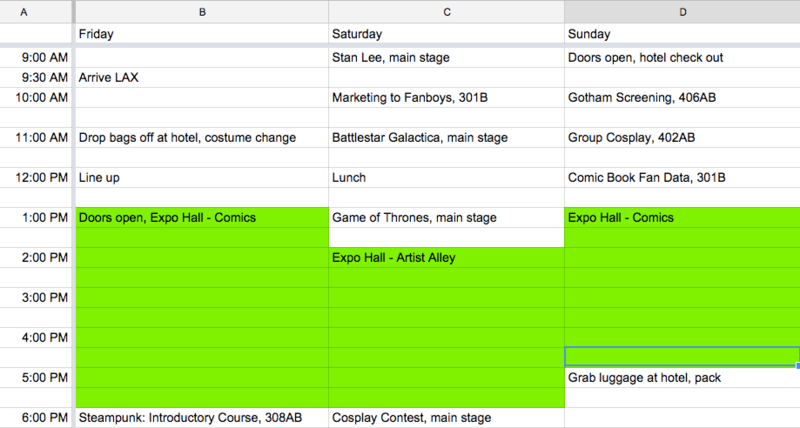 I prefer to use a spreadsheet to list the times and locations of panels, and highlight the time slots I’ll have free. Sample spreadsheet schedule. Click to enlarge. 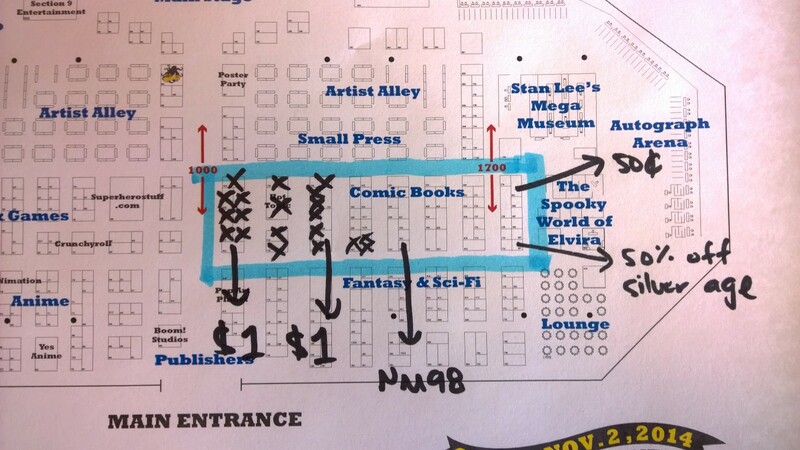 Having a print out of the floor plan is crucial to track which booths you’ve already hit. A lot of them end up looking the same, and it can be hard to remember if you’ve been to a booth already, so it’s helpful to cross off each booth on the map and see which ones are left. Another valuable way to use the floor map is to take down notes of certain booths like, “50% off silver age” or “Thor #165 VF” in case you want to go back later. It can be really easy to forget which comics you wanted and from which booth. Floor plans are usually made available on the website shortly before the con. Sample marked up floor plan. Click to enlarge. If nothing else, this is the single most important thing you can arm yourself with. Without a clear list of issues you need, you’ll be shopping completely blind and can end up buying issues you already have, or more likely, going way over budget buying everything you see. With a list of specific issues, you’ll have a clear purpose when visiting each booth. So how should you format the list? 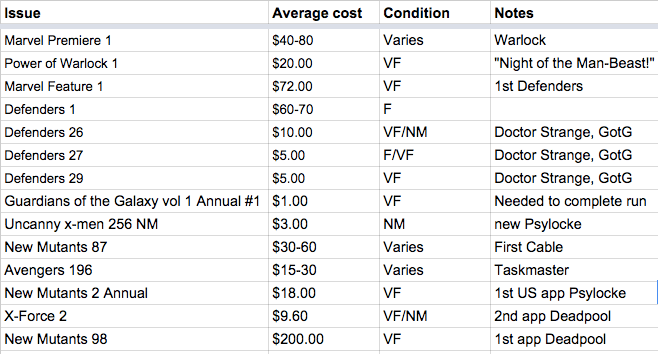 I use a very simple system: Title, Volume and/or Year, Fair Market Value (FMV) and Condition. Fair Market Value is the price that a comic book in a certain condition is selling for in the current market. For example, as of this writing, Defenders #26 in Very Fine/Near Mint (VF/NM) condition is currently selling for around $10. You can find out this information using websites like eBay (sort by “sold” auctions, not current ones), MyComicShop and Atomic Avenue. This is very important because it gives you a baseline figure to budget from and to negotiate against. 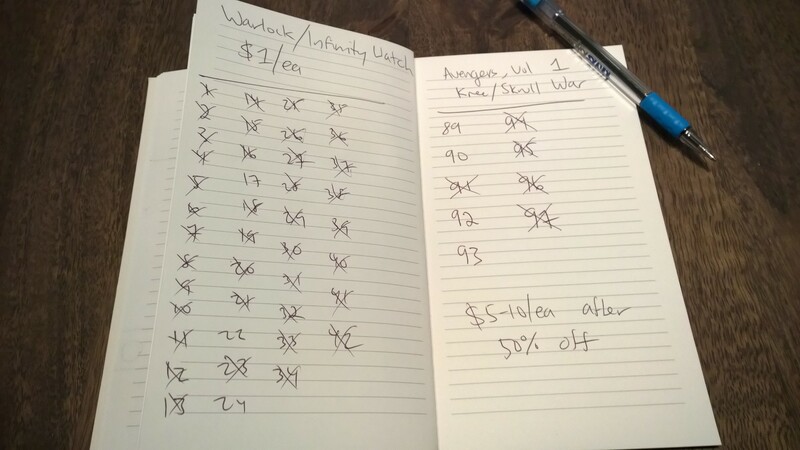 Without being properly prepared with the knowledge of what a comic book is worth, you can easily overspend, which vendors would gladly allow to happen. There are lots of different ways to put together a list, but the most important information is the title and issue number, as well as the FMV by condition. FMV and condition are directly tied to each other, so you must have both pieces of information. It’s up to you to decide how you want to format the information. I like to create a spreadsheet and print it out, but sometimes I’ll simply use pen and paper. Do whatever you feel comfortable with – what’s important is the information and not the format. Sample spreadsheet shopping list. Click to enlarge. Sample notebook shopping list. Click to enlarge. 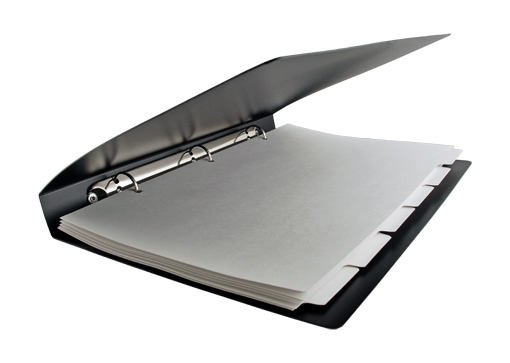 A simple 3-ring binder works well. Equally important for The Bible is how to actually put it together so you can access it easily. If you just staple them together and fold it into your pocket, it’ll quickly get torn and fall apart. Trust me – at the end of a 3 day con it’ll look like it came out of the washing machine. The best method I’ve used it a simple 3-ring binder with hole reinforcement stickers to keep the pages from being ripped out. Plus, it gives you the added benefit of having a hard surface to write on when taking notes and crossing items off the list. I don’t like using my phone because it’s very awkward to keep fumbling around with it, and dealing with dead batteries and marking up a floor plan isn’t a great experience. Keep it simple – pen and paper. You’ll be buying a lot of comics, so how do you expect to lug them around? They can get very heavy, which would be a burden to carry around all day. If you’re only buying a few comics, then I’ve found these Comic Storage Portfolios (available on Amazon for around $10) to work really well. I have 4 of these that I bring with me to smaller cons, or when I don’t plan on buying too much. They store comics safely and you can keep them in a backpack while you walk around. Each one holds about a 10-12 comics. These are PERFECT for New Comic Book Day, btw. 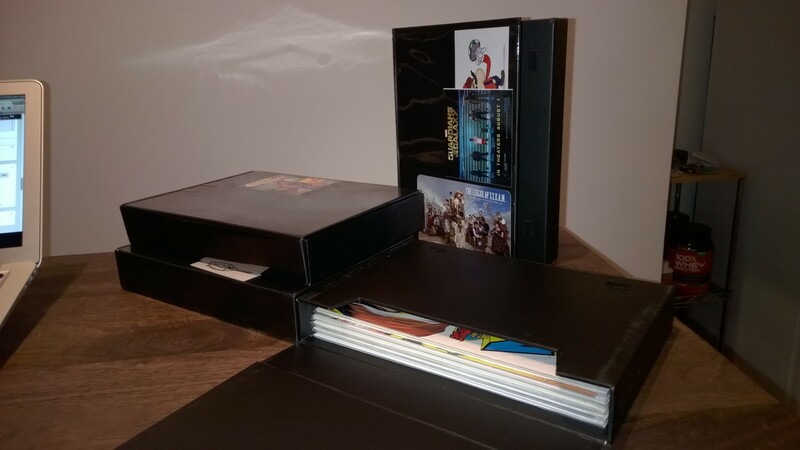 These storage portfolios are perfect if you aren’t buying a lot of comics. If you’re buying a lot of comics, then you’ll need something a bit more substantial. For this, I like to use a short box and hand cart. The set up is simple – strap a short box to a portable hand cart, and secure it with a bungee cord. I like to keep the lid on the bottom, otherwise you’ll have to keep removing and replacing the lid, which can get annoying. This is the best option if you plan on buying a lot of comics, and you can comfortably stack 2 short boxes on one hard cart. I bought this hand cart for $35 and the adjustable bungee cord for $5 on Amazon. Note: some of the really large cons (SDCC, ECCC, NYCC) don’t allow the use of hand carts, strollers and rolling luggage on the show floor, for safety concerns. Check the FAQ for the con, as they will mention it there. If they don’t mention anything, you’re probably fine but it’s always safe to double check with the organizers beforehand so you don’t get caught having to bring it back to your car or hotel with no back up plan in place. Unfortunately, you’ll have to pay for those comics you want to bring home. This part is pretty self-explanatory – set a budget and try your best to stick to it, and only spend what you can comfortably afford to. Anything more in-depth would be a lesson in managing your personal finances, which I’m not qualified to give. Here’s how I handle my budget at comic cons – I set a strict budget of how much I’m comfortable spending, and split it up into daily budgets. For example, if I’m going to a 3 day con with a $150 budget, I’ll set a daily budget of $50. I switched to this tactic after going to so many cons with a set budget and blowing it all on the first day (sometimes in the first couple hours), then hitting the ATM again. And again. If I go under budget the day before, then I roll it over and have an even bigger budget the next day. For example, if I only spend $25 out of $50 on day 1, then I’d have $75 to spend on day 2. Bring cash – many vendors accept credit cards, but are more willing to negotiate if you pay in cash. It also helps to physically see how much money you have left to spend, versus doing the math in your head if paying by card. You have The Bible, you have a storage solution, you have a budget, you have cash in your pocket, and now you need to actually pay for the comic books. Sounds simple, but as I mentioned earlier, it’s incredibly easy to get ripped off if you’re not prepared. Prices listed at cons are never set in stone, and there’s always room to negotiate fairly. I put emphasis on “fairly” because negotiating doesn’t mean lowballing the vendor or being upset if they don’t agree with your offer. You want to get a good deal, and the vendor needs to make money on the deal. So how do you make a fair offer? Luckily you took my advice and researched the fair market value by condition for all the comic books on your list, which is the most powerful tool you have to negotiate with. If you see that The Walking Dead #42 in Near Mint condition sells for $20 on average but the vendor is asking for $50, then you know not to pay that asking price. However, you can ask the vendor if he’s willing to come down on that a bit, because you know it’s not going for that much in the current market. Let’s say you both settle on $25 – is it worth paying the extra $5 over FMV for it? That’s a judgement call, but in that case I’d say yes, because you can see and inspect the book in person and take it home immediately, without paying for shipping, so it all works out. A big part of negotiating on a fair price is taking into account the cost of shipping, as well as the uncertainty of receiving an inaccurately graded comic book that you bought online. You also should think of the vendor – a lot of time and labor goes into packing all the comics, driving them over to the con, paying for the booth space and setting it up. If they only sell it for $25, then they lost time and money and should have just stayed home and sold it on eBay. There’s two sides to every negotiation, and you must be willing to take multiple factors into consideration (not just price) to settle on a fair price that works for both parties. Should you wait until Sunday? 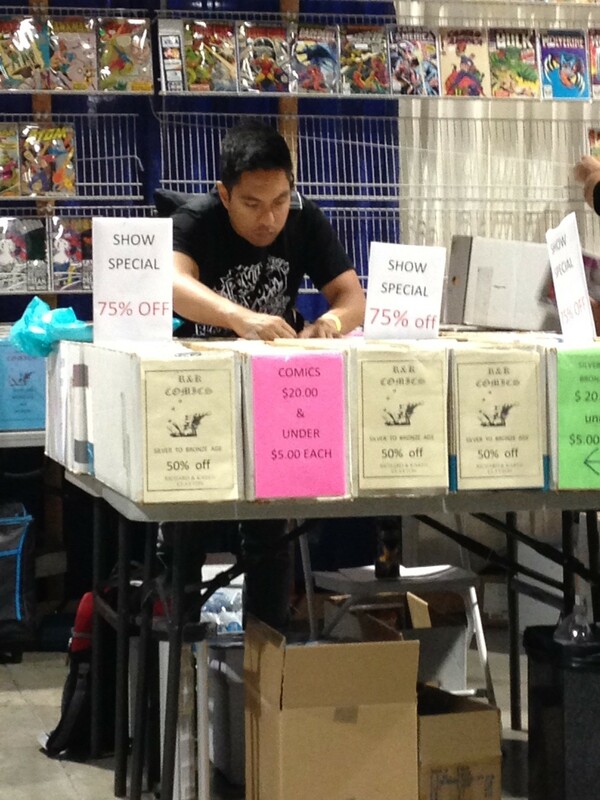 At Long Beach Comic Con frantically looking for last minute deals while the vendor is literally dismantling the booth. Some buyers like to wait until Sunday afternoon (or whenever the last few hours of a con are) to make their purchases, believing that vendors are more likely to negotiate steeper discounts to unload inventory as the show is winding down. In general, this seems to work, but there are some pros and cons to this tactic. Obviously if you see a comic book you want from a dealer on day 1 and don’t buy it, then it might be gone by the last day. This is a risk you have to be willing to take if you want to save a few bucks. Ask yourself, “How bad do I want this comic?” If the answer is, “I can’t leave the con without it,” then just buy it right then and there (but don’t forget to try and negotiate a fair deal if you think it’s overpriced). While this guide does offer some tips that have worked very well for me, they may not be right for you. There’s so much fun to be had at cons in exploring new titles, writers and artists, as well as discovering some hidden gems or being introduced to things you wouldn’t normally buy. Allow yourself the freedom to experiment a bit and allow for some free flowing discovery. One of my favorite things to do at cons is talk to the vendors and ask them what they have to recommend – it’s so much fun learning what other people enjoy reading, and to hear what they think you would like to read. That’s a big reason why we started Shortboxed in the first place! I hope this was helpful and allows you to be successful at your next comic con. Let us know if you use any of these tips, or if you have any other tips that you use yourself. Leave a comment below and share the knowledge!